Who makes the best adjustable gas block on the market right now? 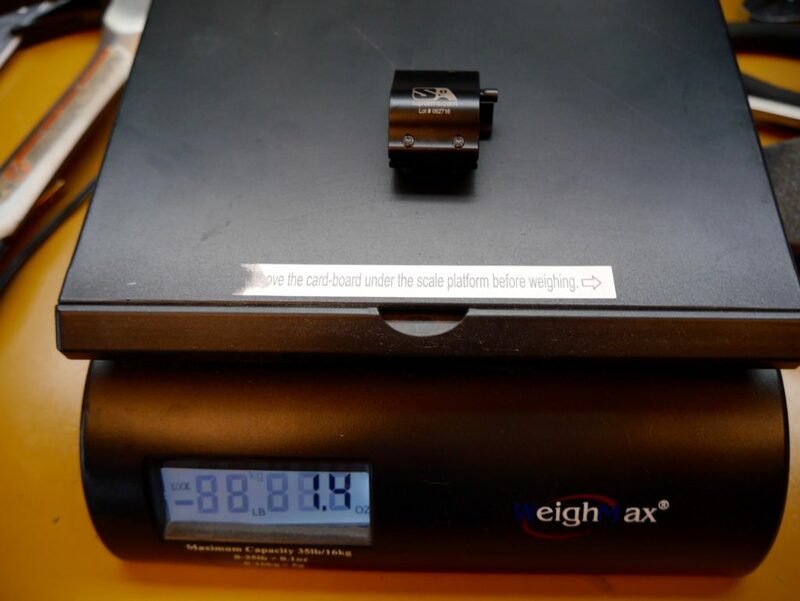 Easy stuff…they’ve got two colors, two install methods (set screw + clamp), and all the sizes you might need. 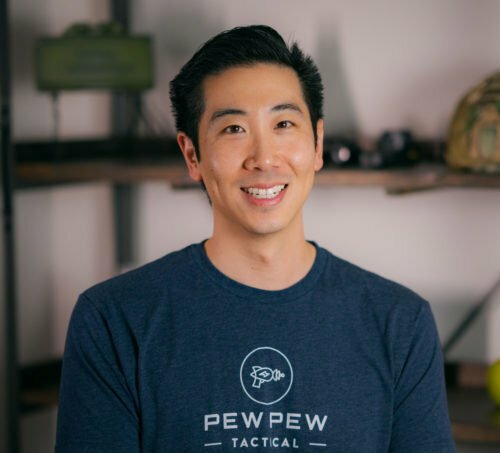 Don’t worry…I’ll explain everything in detail and go over why it’s the best choice for pencil barrels, suppressor users, and anyone else tired of regular gas blocks. If you haven’t checked out our Guide to AR-15’s, check that out first, but here’s the gist on gas blocks. Gas blocks take some of the gas behind the bullet to use it to push back the BCG so it can eject the spent brass, strip another round, and reset the hammer. It’s what makes the AR-15 semi-automatic instead of bolt-action. You can see it on top of the barrel at the right side of the GIF. The thing is…there’s usually excess gas that moves back so you can account for weak ammo or some dirtiness in the system. This excess gas adds felt recoil since it sends the BCG back with extra force. 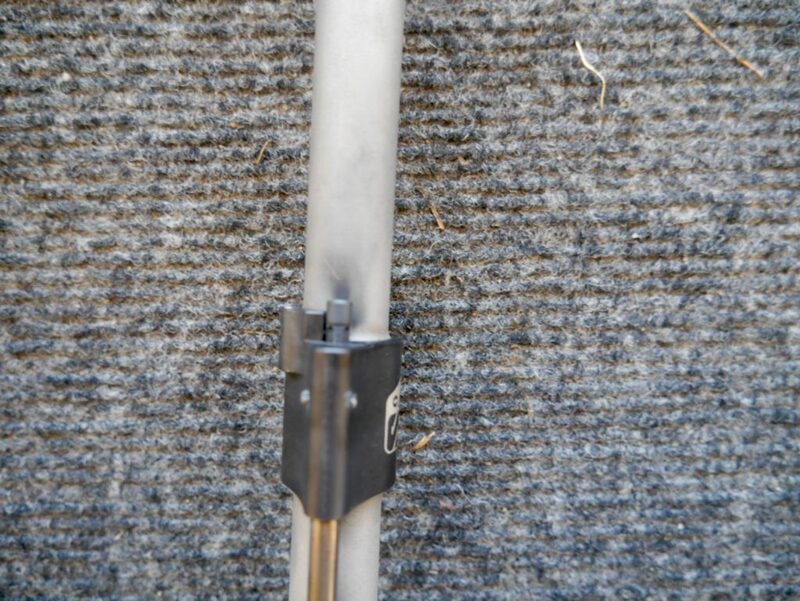 The adjustable gas block restricts the size of the hole that allows gas to move back towards the BCG. This way you can tune your gas block to release the least amount of gas for your combo of rifle and ammo. There’s a bunch of these as you can see in our Best AR-15 Upgrades article. 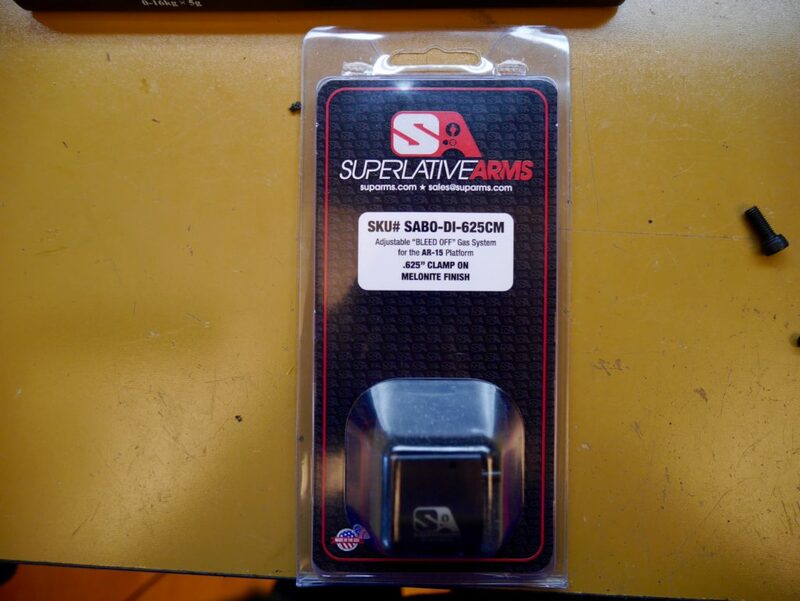 So what does Superlative Arms’ adjustable gas block ($89) do differently? By turning the screw which has some nice clicks, you can choose the best kind of gas block performance you need. From 0 to 4.5 turns, you restrict the flow of gas, which is what all the other adjustable gas blocks do. This extra gas is sent forward out the barrel. You can see with this model from Michael Bell, the turns open up the hole for gas to vent back towards the BCG. Less gas = less recoil. At 4.5 turns, the gas port is fully open and acts as a normal non-adjustable gas block. This is what you would use if you want maximum reliability with a little extra recoil. 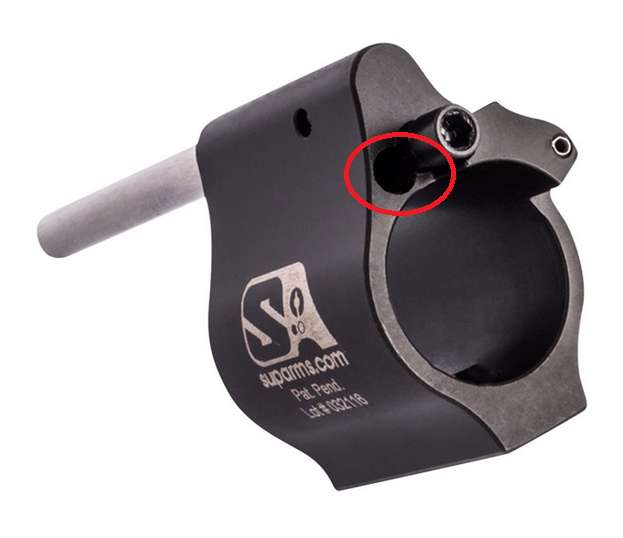 This is where Superlative Arms shines…instead of restricting the hole and letting the gas go out the muzzle, an extra area opens up where the gas can “bleed off” from the gas block itself. The area is next to the adjustment screw and vents the extra gas forward. So it accomplishes the same recoil reduction but doesn’t send gas out through the barrel. And yes…it works! As evidenced from my competition upper build with the Superlative. And how it is now after A LOT more rounds. I think there’s two groups of people who will really get the best benefit out of the Superlative. Having that extra gas go forward means it is going through your suppressor…and that means increased blowback on yourself and extra crud in your gun. Bleeding off the gas will decrease the blowback and reduce a lot of the carbon that will gum up your action. Two possible questions come up and are answered by Michael Bell again. Will velocity be negatively affected since extra gas is being bled off? Is there excess sound since gas is being bled off from the gas block? He answers those two questions in his field review. TLDW: Yes, slightly. No, actually a decrease of ~8dB. I don’t fall in the suppressor category (yet!) 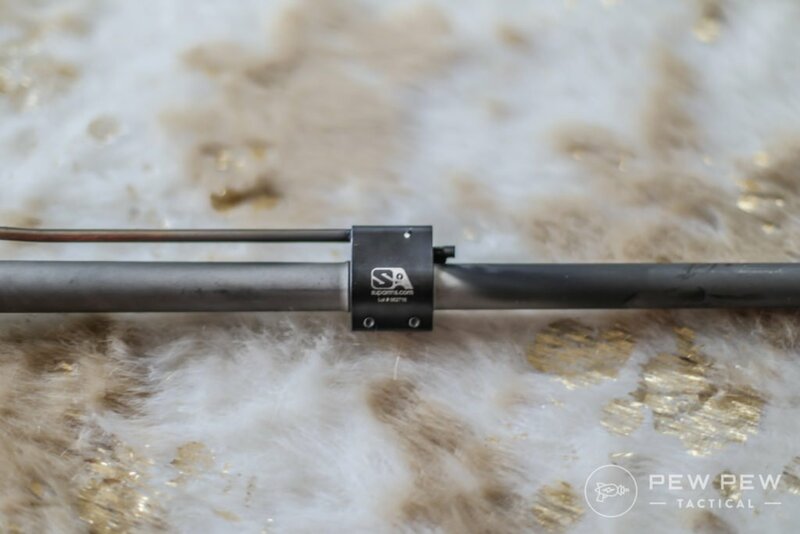 but I first found out about Superlative when I wanted to build a pencil barrel (.625″ compared to the normal .750″) from Ballistic Advantage and couldn’t find an adjustable gas block for that size. If you don’t fall into those categories, there’s still some awesome stuff about the Superlative that might still make it worth it. The main thing is that turning screw does not do the actual blocking of the gas port. I’ve found with other adjustable gas blocks (like my old go-to Seekins, $57) that the carbon seizes up the screw after a couple hundred shots. True…you aren’t going to be adjusting on the fly that much, but it was pretty annoying to have to take the hand guard off to muscle the screw. Other stuff…it’s pretty light as evidenced above, there’s two colors, there’s a mechanism that prevents you from backing out the screw too much, and you have the choice of set screw or clamp. My opinion…if you don’t have set screw dimples already, go with the clamp. 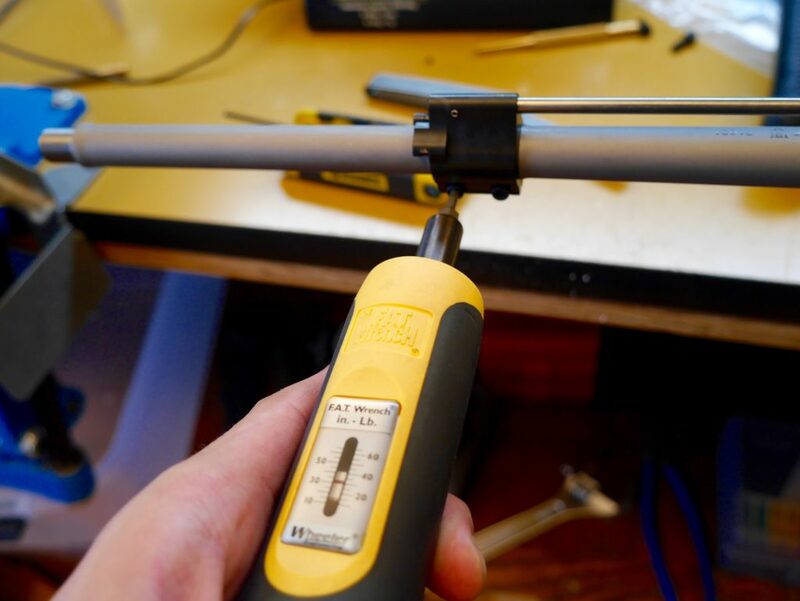 It’s the most solid method and evens out the force on the barrel (if you’re using a torque wrench…which you should). The Superlative Arms Adjustable Gas Block ($89) is perfect if you are running a suppressor or are using a pencil barrel. It also offers some great stuff even if you aren’t. If they are out of stock there, you can also check out Rainier Arms and the Superlative Arms actual site. 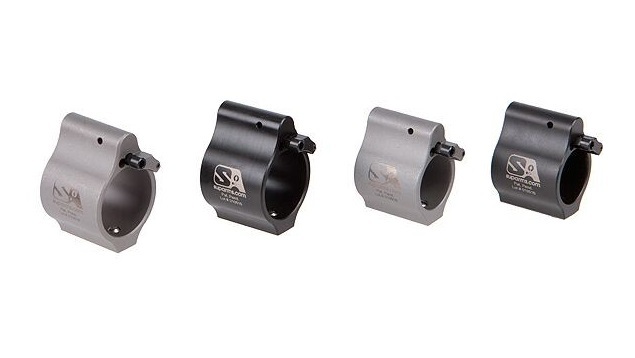 Would the bleed off from an appropriately tuned adjustable gas block decrease the excess gas enough to allow for use of a muzzle brake without disturbing nearby shooters from concussion or noise? Statement in this article: “Bleeding off the gas will decrease the blowback and reduce a lot of the carbon that will gum up your action.” Then why not bleed off more gas to reduce more carbon and blowback? Why not bleed off all the gas and eliminate ALL blowback and carbon? The “bleed off” model does not make sense. You WANT the gas to go out the end of the barrel, except for just enough to cycle the bolt. So i recently bought a new B.S.F. 18in 223 wylde barrel and got the SA gas block to go along with it, but I am just discovering that the new .875 OD of the barrel and the the block on top of that wont fit into my Aero Atlas S-One hand guard. So i was Curious if any one has had a similar issue and has any suggestions on handgaurds that would fit properly? If you could actually keep any in stock for sale. How many inch pounds do you torque the superlative with set screw option?